I have managed to get out of order. We did Claydon, then Oxford, then Little Moreton Hall, then Nantwich. Sorry – as a holder of half a geography degree from the premier University (Cambridge, in case you don’t know), I now have to write about Oxford having got my geography wrong … . We are in Oxford on Tuesday 13 May. Christ Church is a 12th century church, one of the oldest buildings in Oxford. Cathedral and College Chapel. A nice welcome, a friendly leaflet (it invites us to attend a service), which tells us that “Cathedral time is five minutes later than standard time”. 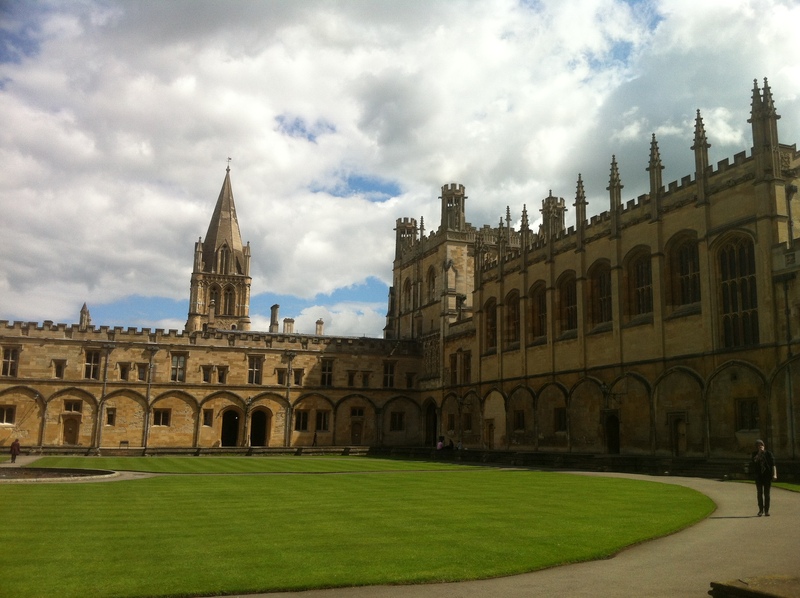 The Cathedral and College keep the old Oxford time – five minutes west of Greenwich. Most places had local time until the coming of the Great Western Railway – they soon realised that Bristol time being different to London time was going to cause all sorts of problems. 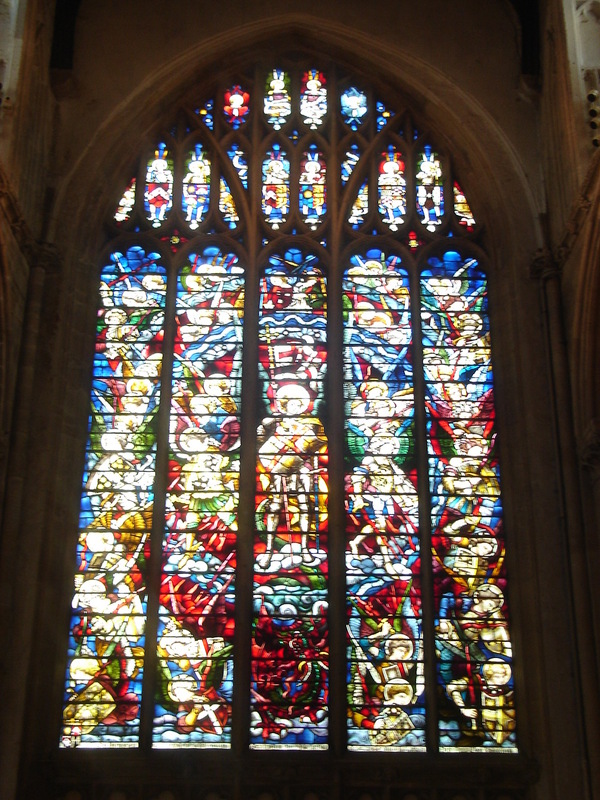 It also tells us that the Cathedral is a place of worship, a place of music and a place of prayer – the choir was founded in 1525 and consists of 16 boys and 12 men. I had forgotten my camera – the photos in this blog were taken on my phone or by my friend Deb (thanks Deb). There’s also quite a lot of things we missed – I am not very good at taking photos on my phone (I wobble) and Deb was running out of battery. 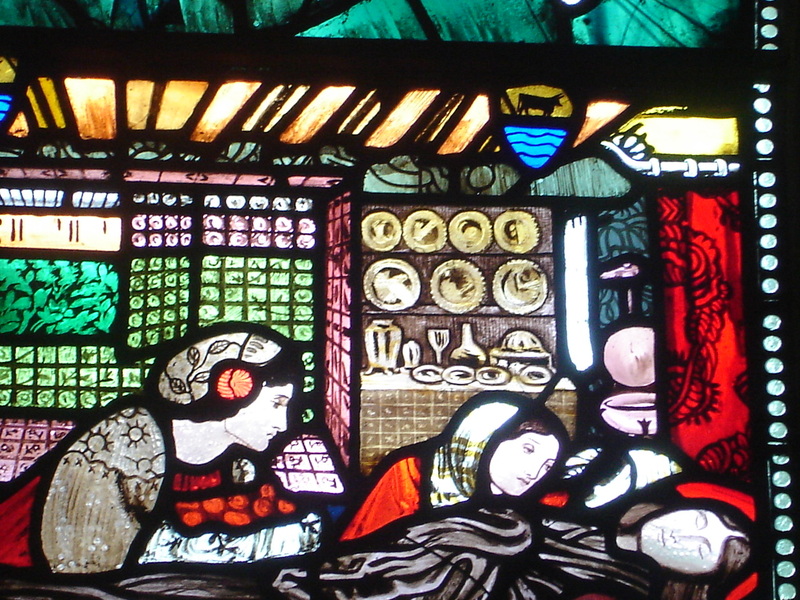 Frideswide is the patron saint of Oxford and founder of the first church on this site – she lived c 680 to 727. 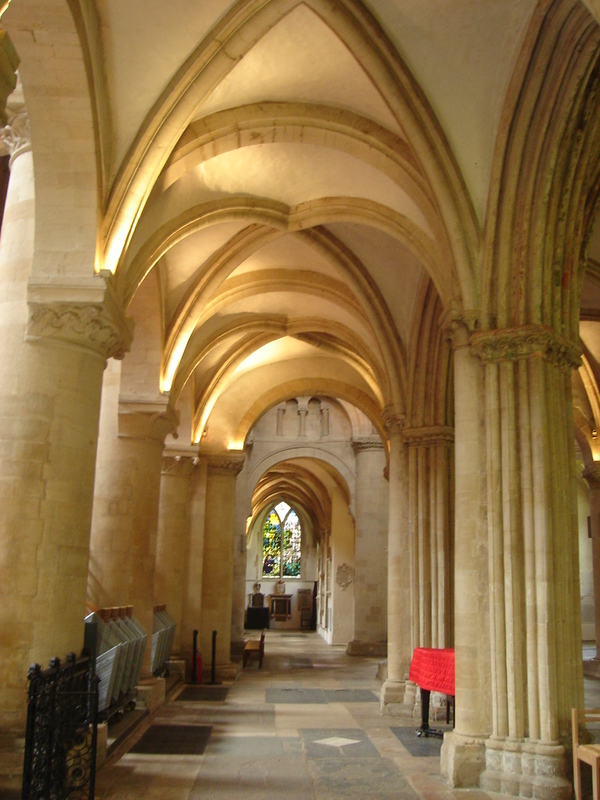 The present building was constructed by the Augustinian monks as a monastery church. 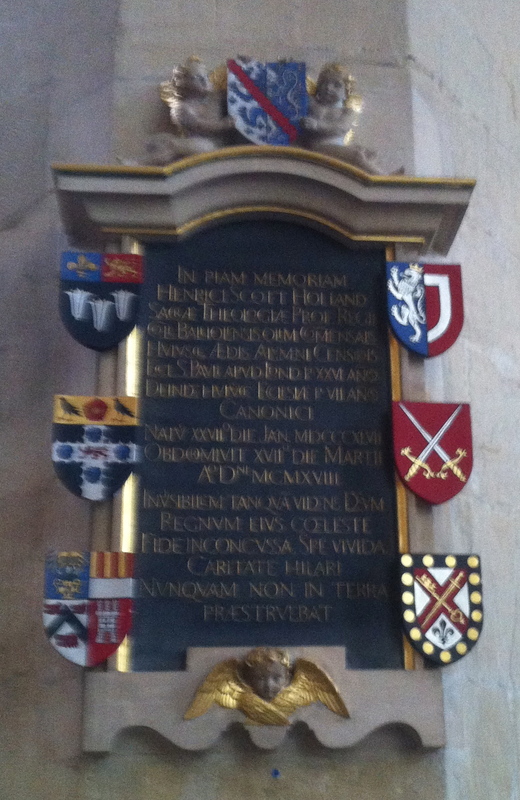 The monastery was suppressed in 1524 and Cardinal’s College was founded by Cardinal Thomas Wolsey on this site. The church became the college chapel. 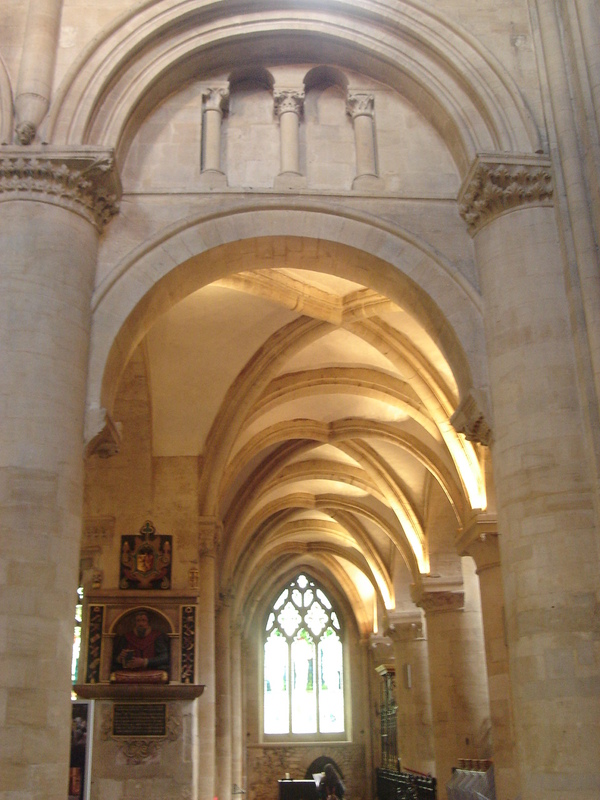 In 1546 it became a cathedral, and the college and cathedral were refounded by Henry VIII as Christ Church. 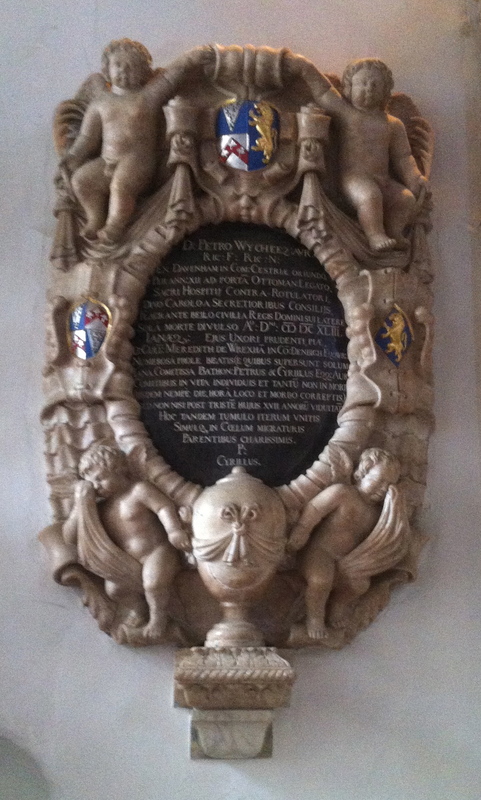 During the Civil War Charles I lived and worshipped here. 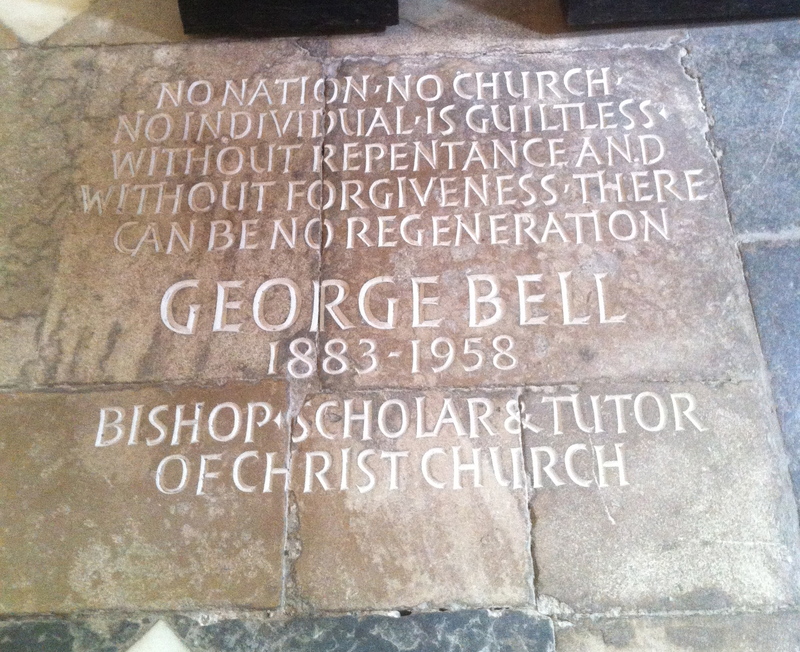 John and Charles Wesley were both ordained here. 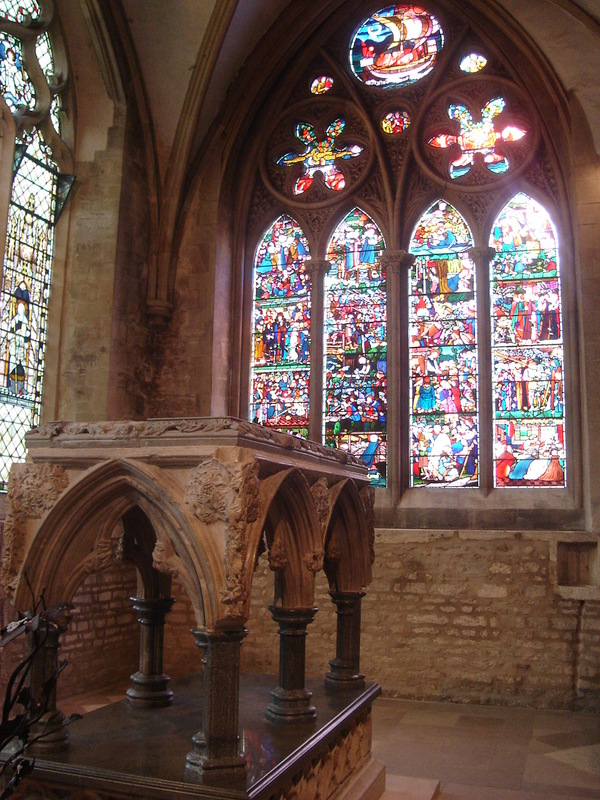 The interior of the Cathedral was re-designed by Sir George Gilbert Scott 1870-76. Anthony Eden and Robert Peel, John Wesley and Rowan Williams, Lewis Carroll and David Dimbleby, Norman Painting (Philip Archer) and Donald Swann, will all have attended. 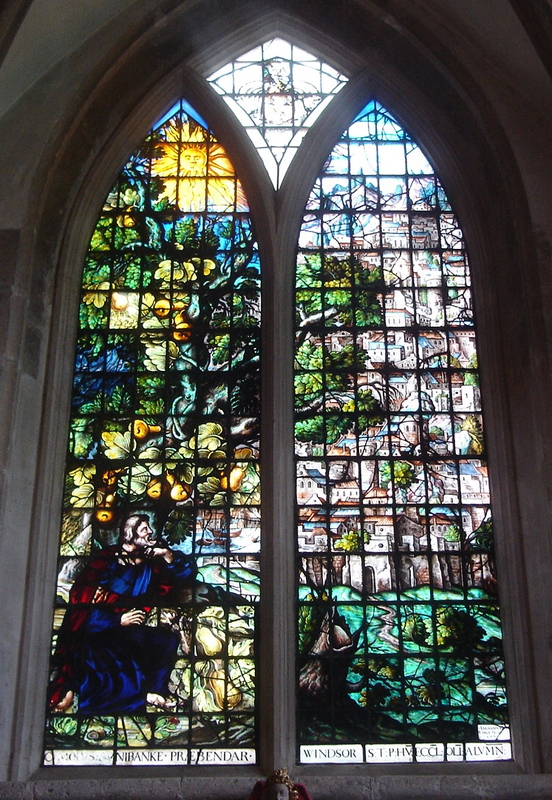 The Jonah window by Abraham van Linge 1630s. 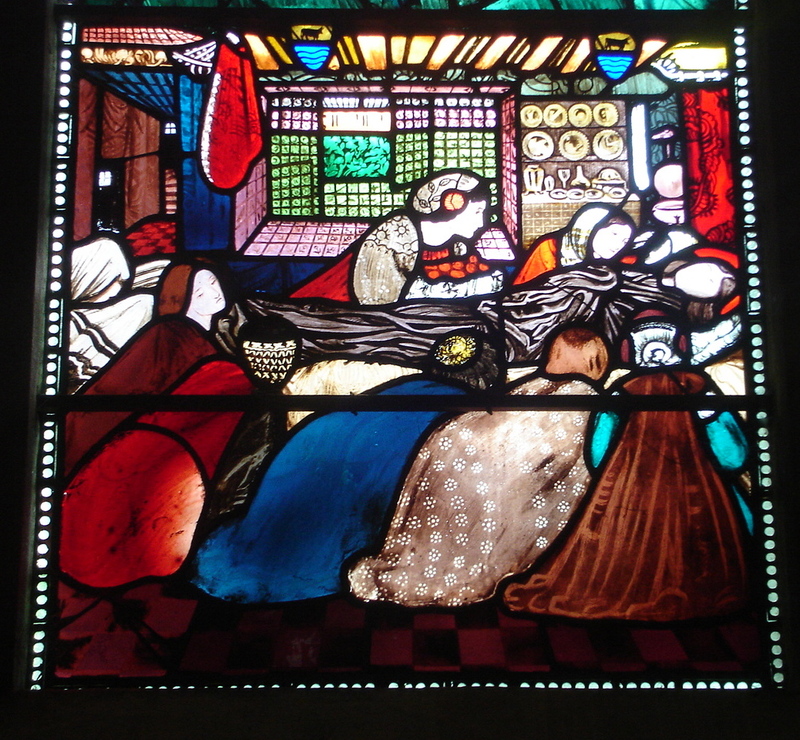 Only Jonah is made of stained glass, the rest of the window is of small panels of painted glass, showing the city of Nineveh in minute detail. 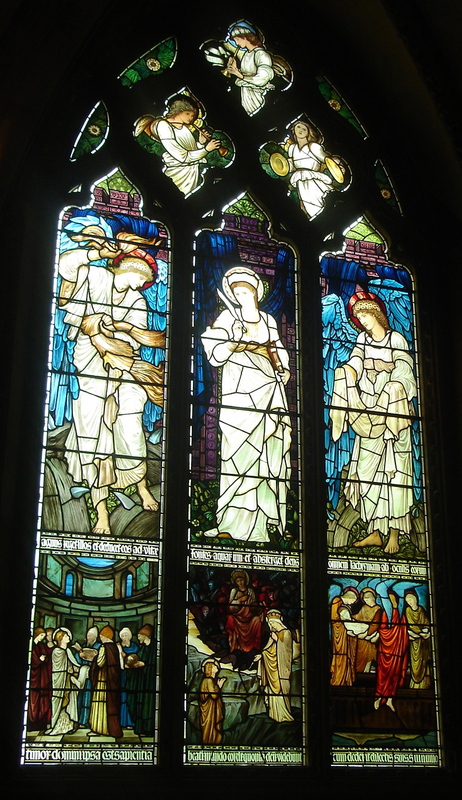 Deb knew the Chaplain on duty who took us up to the Latin Chapel to see the toilet in the stained glass window. 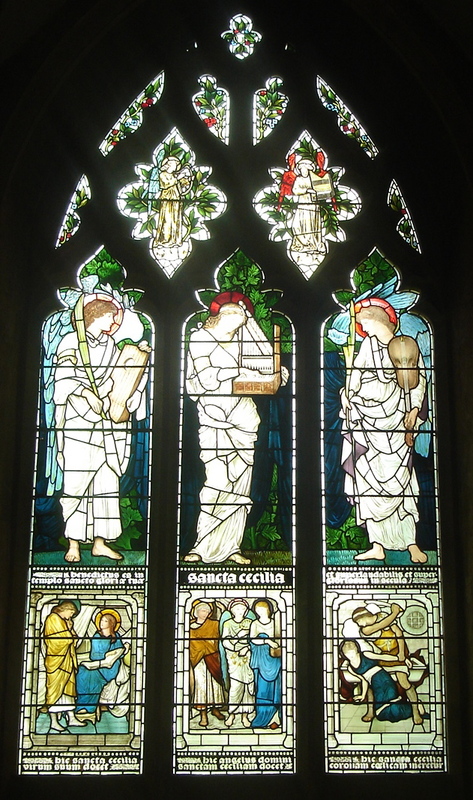 The St Frideswide window by Edward Burne-Jones 1858, tells her story – and includes what is unmistakeably a pink loo. 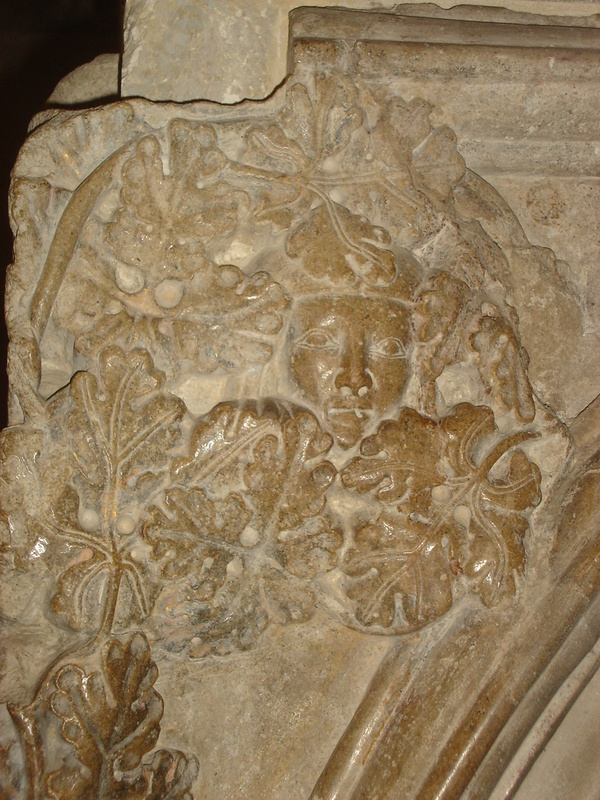 The shrine once held the relics of Frideswide and has some lovely carvings – I assume the carvings include these green men. 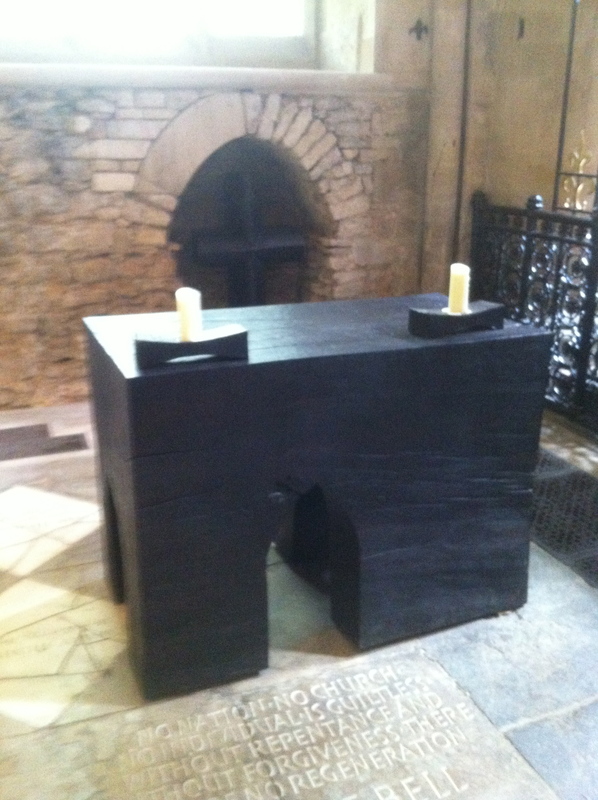 The Bell Altar is rather special. 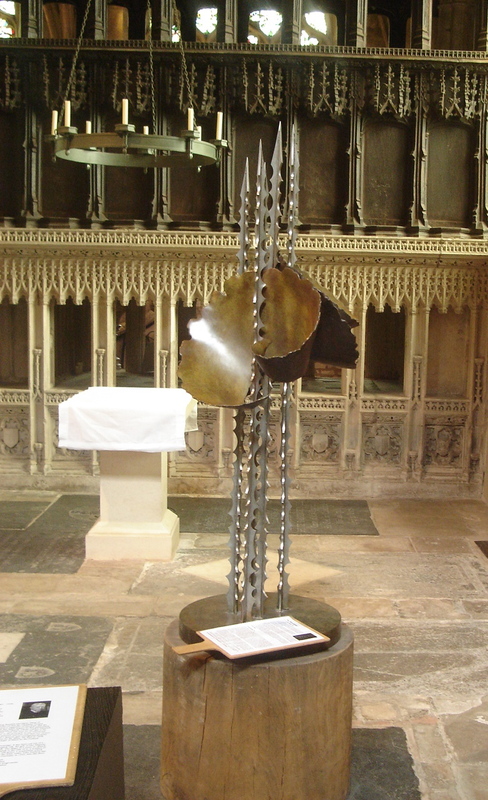 It was designed by Jim Partridge in 2000, made to mark the Millennium and dedicated to the memory of Bishop George Bell who courageously opposed the bombing of German cities in World War 2. 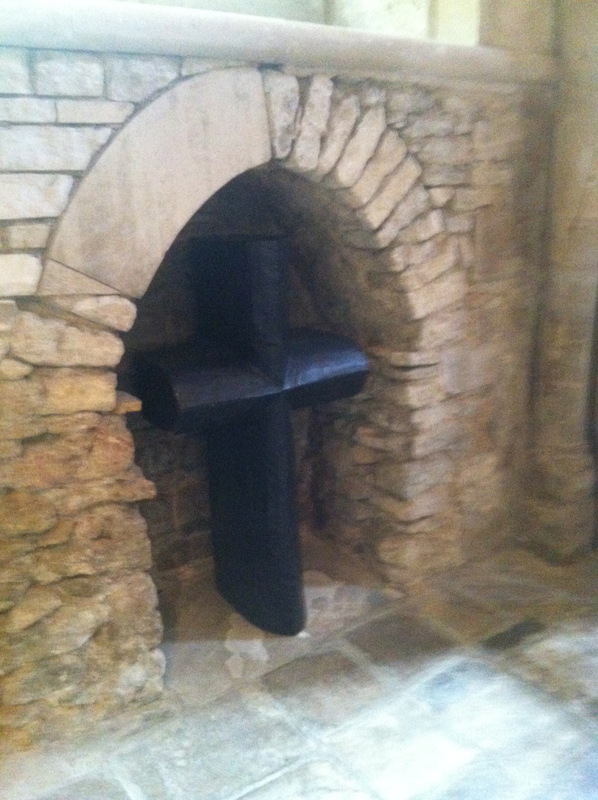 The cross which stands near it was cut from the underside of the altar – rather symbolic. I also liked this – Charlotte Mayer’s, The Thornflower. The thorns, sharp and cruel, are cut in stainless steel, the flowers, modelled in wax and cast in bronze, are soft and embracing. All of us have had thorns and flowers in our lives. “When we open our heart and see all others as ourselves, the flowers begin to blossom, joy enters our life and there is a chance that reconciliation and peace can become an everyday reality”. More information at this website. 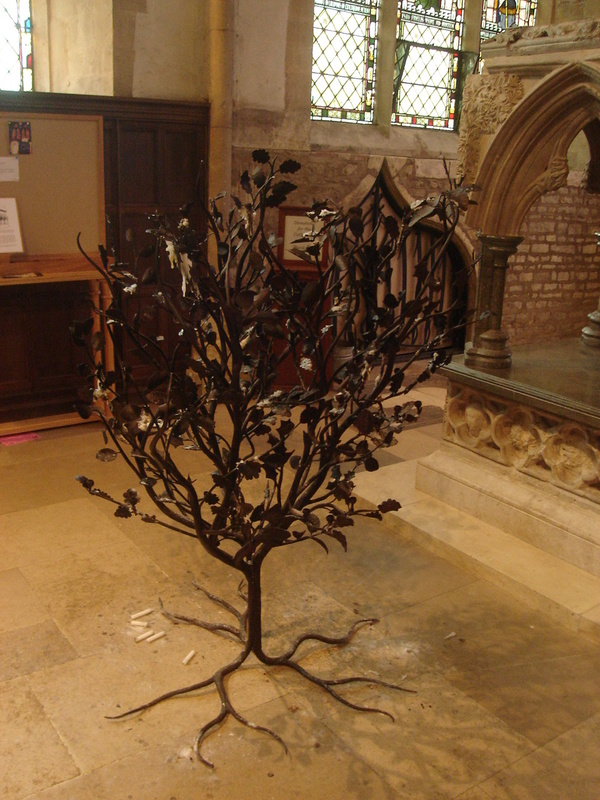 I liked this prayer tree too, though made no notes about it. 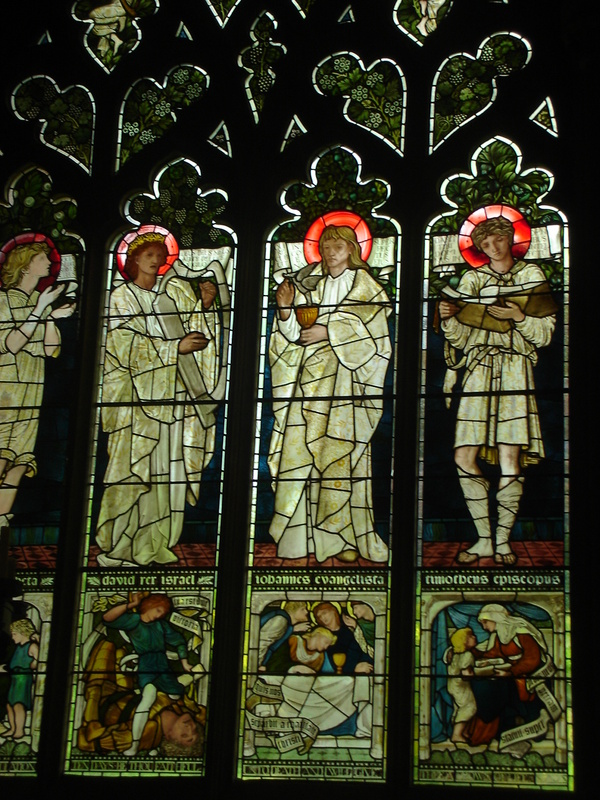 There is some rather nice stained glass – including windows by Edward Burne Jones (1878). 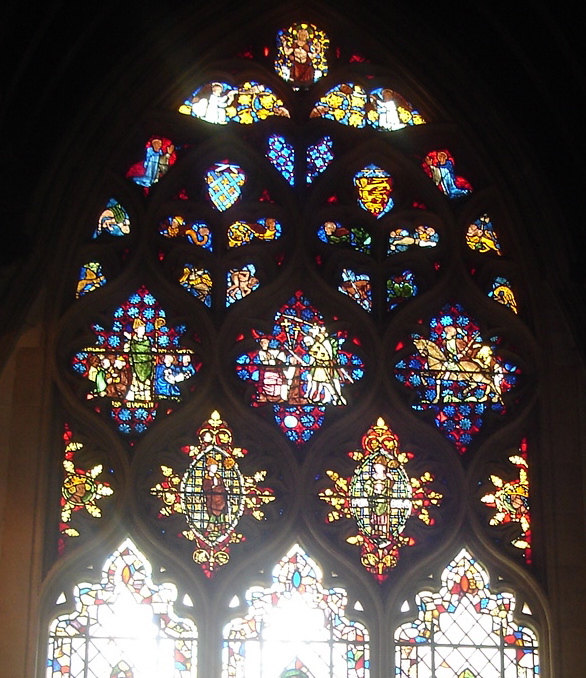 The bottom window is the St Catherine window – the figure in the central window (St Catherine of Alexandria, she of the wheel) is a portrait of Edith Liddell. Her sister Alice was the inspiration for Alice in Wonderland. 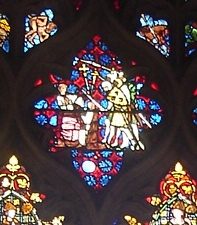 The window is the Becket Window, circa 1320 – the oldest in the Cathedral. 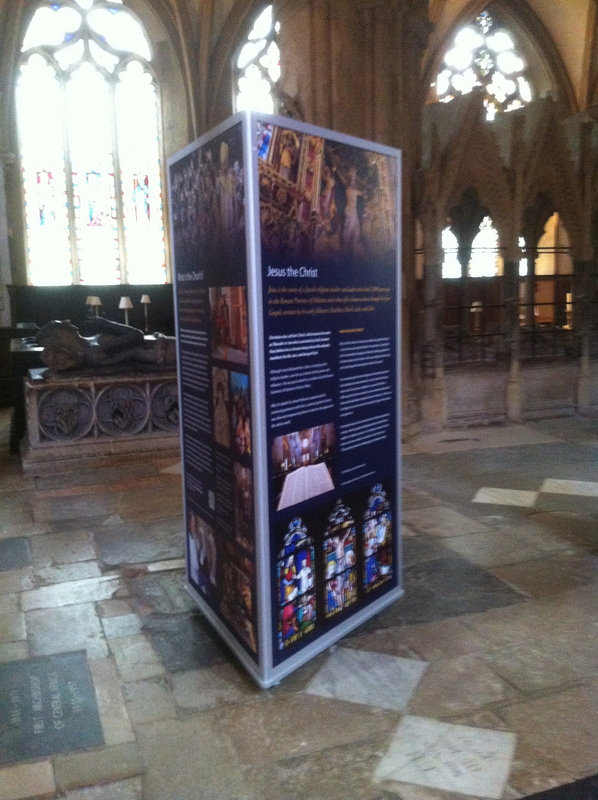 The panel showing the martyrdom itself was defaced in the C16 and the original face of Becket is now missing. 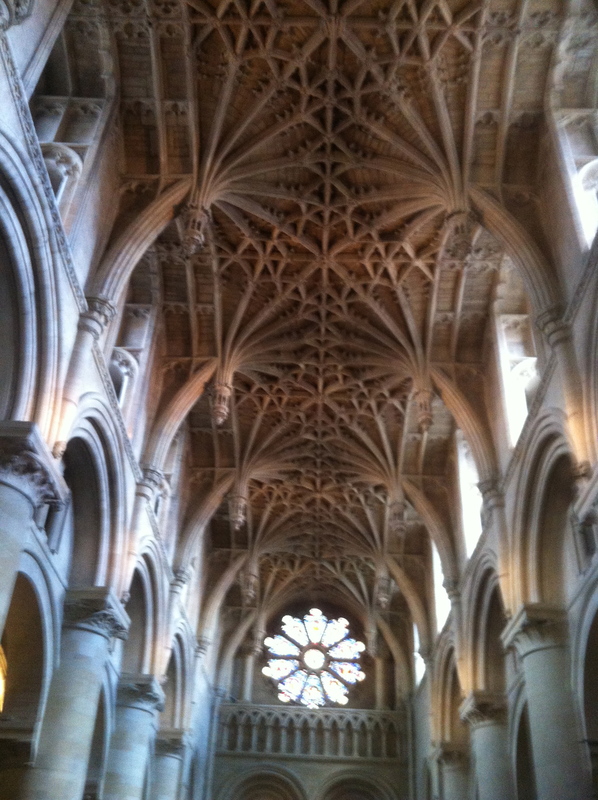 The Chancel vault is rather lovely – built by William Orchard in 1300. 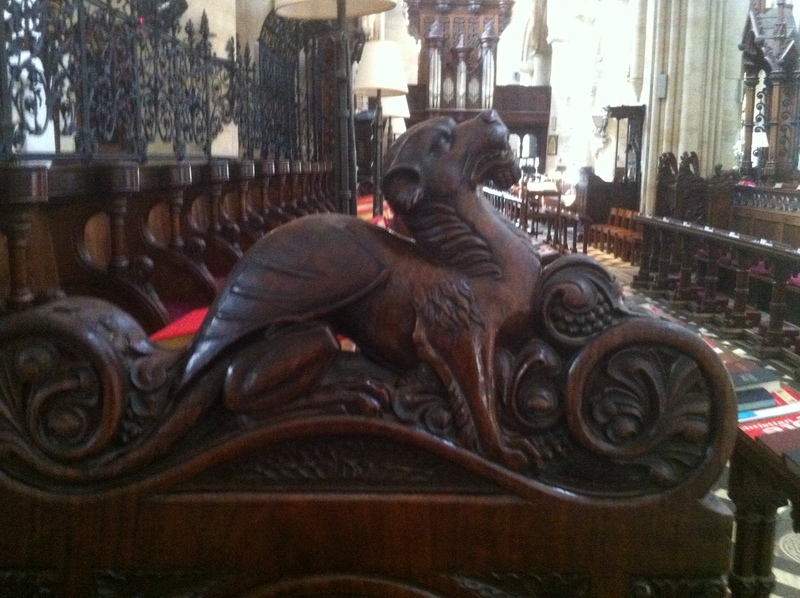 There are lovely views across, looking up into different chapels, and there is some rather nice woodwork too. 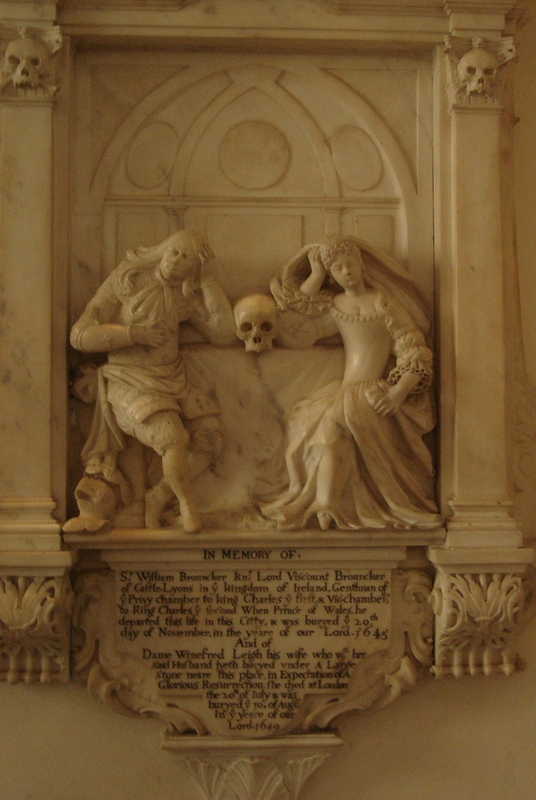 There is a lovely selection of lovely tombs and memorials – as you would expect in a place like this. 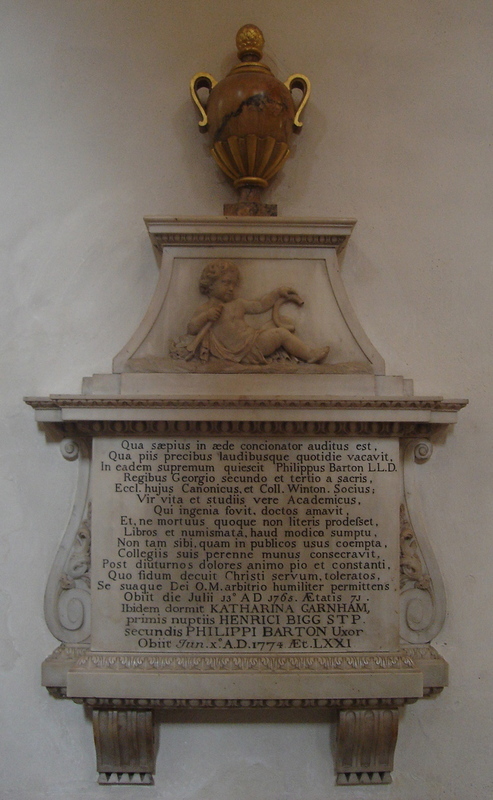 I suppose the problem would be who not to memorialise! 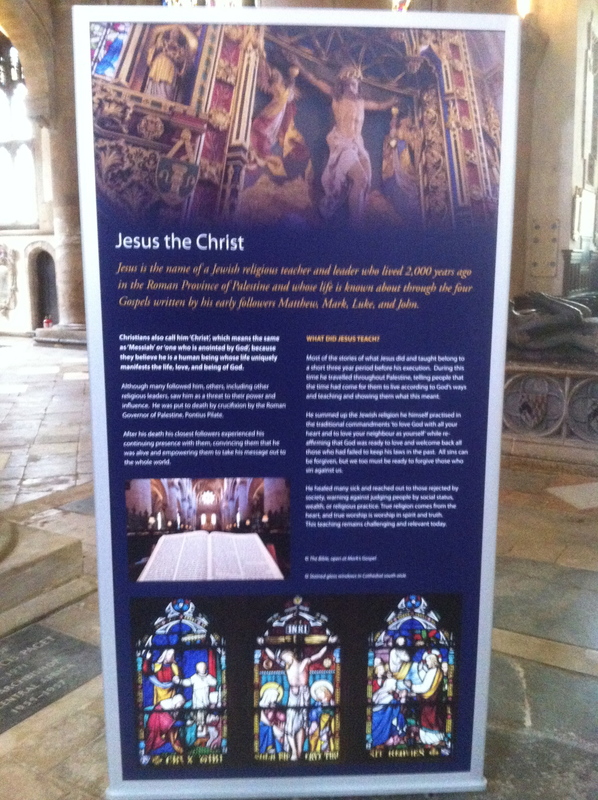 Also in the Cathedral are what the chaplain called the Toblerones – triangular display boards which explain the Christian faith. Sensible, well-written, well-illustrated. Well done. Deb and her husband are based at Regent’s Park College, Oxford. 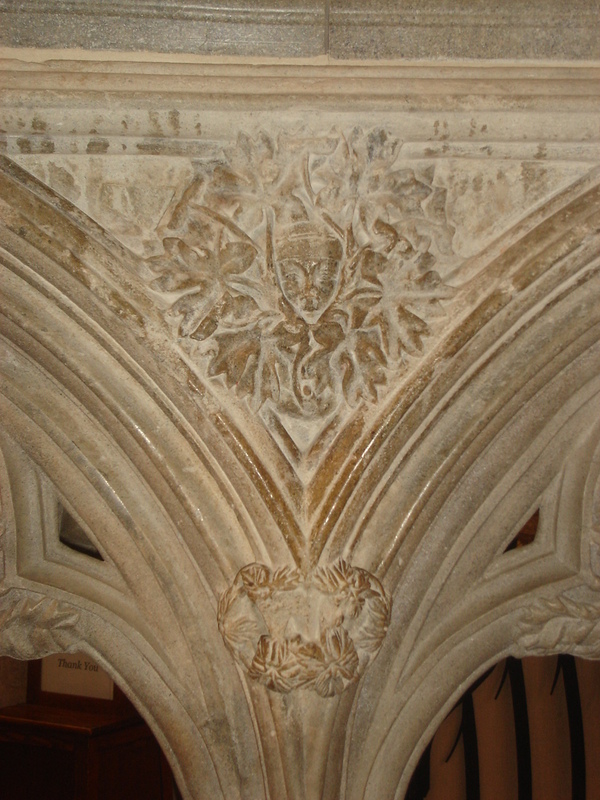 After our trip round Christ Church we had drinks in the SCR, then went to a lecture by John Harper of Bangor University on “Experiencing Late Medieval Liturgy: Sound, Silence, Space and the Senses”. I had come across John was he was leading the RSCM. His current title is “Research Professor of Music and Liturgy, and Director for the International Centre for Sacred Music Studies, University of Bangor”. This lecture was under the auspices of the “Oxford Centre for Christianity and Culture” – we go for snappy titles round here! The website is here. 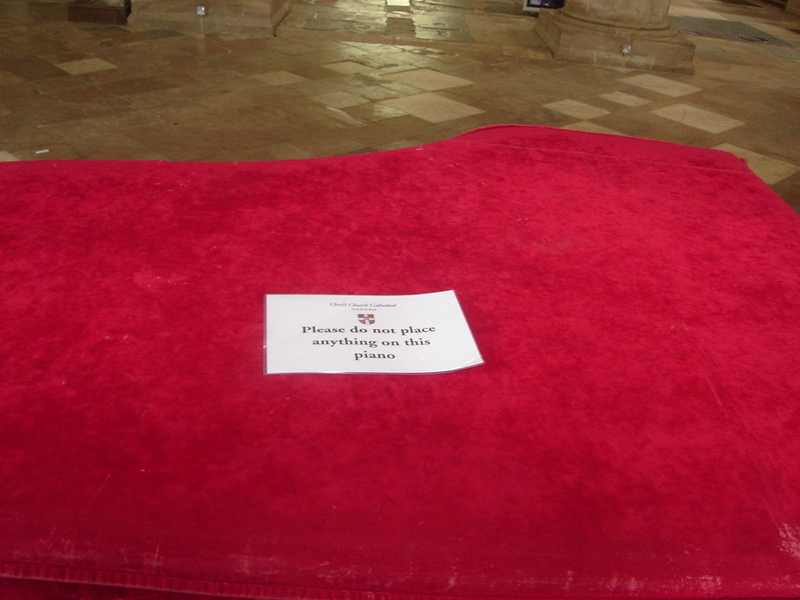 This entry was posted in Cathedral, Outside Northumberland, World War 1. Bookmark the permalink. Just wondered why there no references to people like Alice and Harry Potter? Because I can’t write about everything!